With 576 wire-speed 40 Gigabit Ethernet ports and 60 Tbps throughput, the Cisco Nexus 9516 is the industry's highest density wire-rate switch, and was selected as a finalist in the data center category for the 2014 Best of Show Interop award. The Cisco Nexus 9504 switch, along with the Cisco Nexus 9616, is the latest member of Cisco's Application Centric Infrastructure portfolio. Cisco celebrates the 5th Anniversary of the Cisco Unified Computing System, its innovative server platform that unifies computing, networking, management, virtualization and storage access into an integrated architecture server, at its annual Partner's Summit event today. LAS VEGAS, NV, MARCH 24, 2014 – Cisco today continued its rapid pace of Application Centric Infrastructure (ACI) innovation by introducing the new Cisco Nexus 9504 and Nexus 9516 switches to the Nexus 9000 portfolio®. The centralized policy-driven automation of the Cisco Application Policy Infrastructure Controller (APIC), application profiles and Nexus 9000 switches combine to help organizations build highly secure cloud networks and hybrid clouds. Cisco also announced an addition to the Nexus 3000 family: the new Nexus 3164Q switch designed for the demanding workloads of massively scalable data centers (MSDC) and big data. Building on the programmability offerings of the Cisco 9000 portfolio, the Nexus 3164Q supports widest range of automation tools for Cloud providers including Linux Container support, XML, JSON, Puppet/Chef, Python, and OpenStack. Cisco Nexus 3000 switches power eight of the 10 leading cloud providers' networks covering the majority of their footprint. The announcements come as Cisco celebrates the fifth anniversary of its highly successful Unified Computing System (UCS)™. du, a leading integrated telecommunications service provider in the United Arab Emirates and the fastest growing operator in the Middle East, is consolidating several data facilities into two next generation data centers designed to host new cloud services. 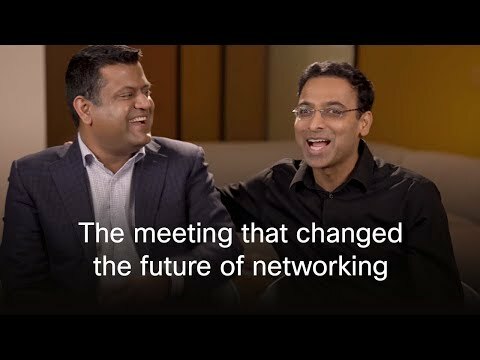 "We selected Cisco's Nexus 9000 series switches and Application Centric Infrastructure as the foundation for our new data centers because the solution will streamline our operational processes and reduce operating expenses for power, cooling and cabling," said Saleem Al Balooshi, Executive Vice President - Network Development & Operations, du. "We particularly like the Cisco bi-directional optics which gives us four times the 40GE density as well as upgrades to 100Gb using the same cabling infrastructure, thereby removing the necessity for costly fibre upgrades." At 10,000 Cisco Networking Academies in 165 countries, every year hundreds of thousands of IT Professionals worldwide gain the skills to build, design, and maintain networks and prepare for industry-recognized certifications. Cisco continues to lead the way with an expanded curriculum that prepares systems, network and security professionals for the new private, hybrid and public cloud models. "Through automation and programmability embedded within our NX-OS platforms, training, support, and certifications, we are empowering over two million networking engineers and thousands of channel partners worldwide to enable our enterprise, commercial, service provider and cloud customers to expand their skill sets while embracing on-premise private and hybrid cloud models with ACI in the data center and across the Access and WAN," said Soni Jiandani, SVP, Cisco. "Cisco is driving opportunities for our partners to build their practices and enable customers a smooth journey to the cloud." Together with the Cisco Nexus 9508, the Cisco Nexus 9504 and Nexus 9516 switches provide the industry's most scalable, programmable, energy-efficient and high-performance data center switch portfolio, designed to address cloud, big data, and complex applications. Independent testing by Miercom demonstrated that the Nexus 9500 series platform provides industry- leading performance, density, and reliability. "Applications such as high performance computing, high frequency trading, Big Data, and cloud computing place higher demands on network infrastructure," said Rob Smithers, CEO of Miercom. "For those networks, high port density, high throughput, low latency, low jitter, and high performance consistency are critical and must be rigorously tested. The Nexus 9500 family has raised the bar in the industry by scoring best overall in benchmark tests, and by demonstrating massive scalability. The Cisco Nexus 9516 proved in test not to drop a single packet at line rate with the largest scale 576 x 40GE review conducted in the industry." The Nexus 9500 portfolio includes system innovations such as the industry's first backplane-free modular switch with 15 percent more efficient power and cooling, and a simpler design with 30 percent of the components to improve mean time between failures with 2.8 times higher reliability. The switch portfolio also provides chassis flexibility for cost-effective 1/10G access designs, 10G/40G aggregation designs, and high-performance 40G and future 100G leaf-spine designs. With 576 wire-speed 40 Gigabit Ethernet ports and 60 Tbps throughput, the Nexus 9516 is the industry's highest density wire rate switch, removing barriers to scale and simplifying network design. The Nexus 916 was selected as a finalist in the data center category for a 2014 Best of Interop award. The Nexus 9504 provides a cost effective option to solve migration from core-aggregation-access to spine leaf architectures. With the Nexus 9504 partners now have new engagement options for customers seeking lower density aggregation and access designs. The new Nexus 3164Q switch, designed for the most demanding workloads, is an ultra-dense, high performance switch that delivers flexible connectivity for either 40 Gigabit or 10 Gigabits ports (up to 256 10Gigabit ports) in a 2 RU and a rich NX-OS feature set. The Nexus 3164Q offers seamless mobility with workload isolation, wire rate layer 2/layer 3 switching, and enhanced programmability options. Developer: use programmatic interfaces for network automation including JSON, XML, Python, Puppet/Chef, and OpenStack. Cisco Readiness Planning: identifies risks and opportunities, provides operational analysis, and delivers detailed migration plans for smooth successful transitions to ACI. Cisco Quick Start Service for Nexus 9000: assistance to help deploy Cisco Nexus 9000 series switches. Cisco Accelerated Deployment Services for Nexus 9000: support rapid transition to an application-centric architecture. Cisco financing solutions: support customers and channel partners worldwide in acquiring innovative data center technologies such as Cisco UCS and Cisco ACI, Cisco provides specialized and flexible financing solutions through Cisco Capital, a wholly owned subsidiary of Cisco Systems. Five years ago Cisco rocked the IT industry by entering the server market and delivering the first true server innovation in decades with the launch of the Unified Computing System (UCS). Despite the difficulty of entering a mature market, Cisco embarked on five years of rapid growth in this market, fueled by continuous technology innovation. Cisco now ranks second worldwide in x86 blade server revenue market share, with 30 percent share in the US and a top five ranking among server vendors overall. Today at its annual Partner Summit, Cisco celebrated the fifth anniversary of UCS with the channel partners who helped fuel that growth. "Innovation and partnerships are the engines of growth for our data center business," said Ken Trombetta, VP, Worldwide Channels at Cisco. "Our channel partners immediately embraced UCS, and today nearly 4,000 partners worldwide sell UCS. We will continue to win with our partners in the data center by delivering innovation through a highly secure and application centric infrastructure." Together with its technology partners, Cisco created a new category of integrated infrastructure solutions: VSPEX® with EMC, FlexPod with NetApp, and vblock with VCE; today these collaborative integrated solutions lead the industry. Cisco also worked with leading software providers such as Microsoft, Oracle, and SAP and the major Hadoop distributors, to optimize UCS as an ideal platform for high-performance computing applications. According to the IDC Worldwide Quarterly Server Tracker, Q4 2013, February 2014, Revenue Share: Cisco is ranked second worldwide in x86 blade server revenue market share, with 32 percent share in the US and a top five ranking among server vendors overall. Over the past five years, UCS innovation included: service profiles, patented extended memory, integrated infrastructure, UCS Manager, UCS Central, UCS Director, and most recently UCS Invicta all-flash arrays which bring flash memory close to the data-intensive applications that need it. "High-performance Cisco UCS servers will improve IT infrastructure efficiency, which is especially helpful for Internet trading, which grew 80 percent in 2013, with more than 120,000 accounts," said Mr. Charamporn Jotikasthira, President and CEO of The Stock Exchange of Thailand. "UCS will help us to accommodate business expansion and improve services for our members and investors. Moreover, Cisco UCS supports 10 times more bandwidth and scalability than our previous system, so we are able to reduce the number of servers, save floor space, reduce operational costs, and cut power consumption by 10 percent, which supports our energy-saving policy." "St. George's Healthcare NHS Trust turned to virtualized desktop infrastructure and bring-your-own-device (BYOD) capabilities, in order to provide better patient care and allow greater mobility and access for personnel to critical hospital operations such as electronic patient records, pathology, picture archiving, and the overall hospital communications system," said Kerman Jasavala, deputy director of ICT for St George's Healthcare NHS Trust. "The system is now powered by 16 Cisco UCS B200 M3 Blade Servers, and our medical personnel is quickly adapting to the liberating cultural change. Our staff especially love the way they can log in from anywhere, treat a patient, and then attend to tasks elsewhere; most significant, the access to information is improving patient care." "Grupo Merza is a retailer group with operations in 27 Mexican states with more than 160 supermarkets and wholesale stores, and our goal is to be close to our customers and offer them the best service," said Alfonso Cedillo, Tecnologías de Información, Grupo Merza. "In order to better manage high volumes of data and improve business decision making, we have deployed the SAP HANA® platform on Cisco UCS. We reduced the time to process information reports by 70 percent and reduced our transactional time by 40 percent. The solution includes prebuilt data models, key performance indicators, role-specific web/mobile dashboards and reports that provide a real-time understanding of marketing, merchandising and store operations." "Dominion Enterprises, a marketing services company, has grown organically as well as through acquisitions, and traditionally we had a very mixed infrastructure with multiple data centers, and a wide range of server, networking and storage vendors," said Joe Fuller, VP and CIO of Dominion Enterprises. "Managing the infrastructure was labor intensive, and power and cooling costs were mounting due to server and storage sprawl. We moved to Cisco UCS, part of an overall FlexPod deployment, as the backbone of our infrastructure with 10 GbE connectivity to greatly improve overall speed and performance. Because of our migration to the UCS platform, we avoided a planned $500,000 capital investment for new infrastructure and our power bill has been cut in half." Citrix congratulates Cisco as they celebrate the 5-year anniversary for UCS! This release may be deemed to contain forward-looking statements, which are subject to the safe harbor provisions of the Private Securities Litigation Reform Act of 1995. These statements include, among others, statements regarding Cisco's delivery of Application Centric Infrastructure, new professional services and an open partner ecosystem and the expected benefits for customers, Cisco's expansion of its Nexus switching portfolio, and Cisco's intention to acquire the remaining interest in Insieme Networks. Readers are cautioned that these forward-looking statements are only predictions and may differ materially from actual future events or results due to a variety of factors, including, among other things, the ability of Cisco to successfully introduce and to achieve the expected benefits of its application centric infrastructure and related services and partner ecosystem, the potential impact on the business of Insieme Networks due to the uncertainty about the acquisition, the retention of employees of Insieme Networks, the ability of Cisco to successfully integrate Insieme Networks and to achieve expected benefits, business and economic conditions and growth trends in the networking industry, customer markets and various geographic regions, global economic conditions and uncertainties in the geopolitical environment, overall information technology spending, the growth and evolution of the Internet and levels of capital spending on Internet-based systems, dependence on the introduction and market acceptance of new product offerings and standards; increased competition in Cisco's product and service markets, including the data center, and other risk factors set forth in Cisco's most recent reports on Form 10-K filed on September 10, 2013. Any forward-looking statements in this release are based on limited information currently available to Cisco, which is subject to change, and Cisco will not necessarily update the information.